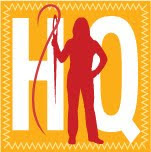 HQ Podcast Episode 25 where I speak (a little) about Hawaiian Quilts is now posted on Podbean and iTunes. I did not have a much time to research Hawaiian Quilts this week as I would have liked so my research is a little thin so stay tuned for Ep. 26 where I'll flesh it out a bit more. Don't forget to join Sandy at Quilting For The Rest of Us for her Two Year Podcastaversary Giveaway Week 3. She's giving away two $50 gift certificates to the Fat Quarter Shop. The Hawaiian Quilt Research Project has contributed photos and information for approximately 651 quilts to The Quilt Index. Go here to view those quilts. One of the founders of the Hawaiian Quilt Research Project, Elaine Zinn, was interviewed by The Alliance for American Quilts in 2008 where she talks about her her own interest in Hawaiian Quilts but how she and Elizabeth Akana (whom I mentioned in the podcast) began documenting quilts for the above mentioned Hawaiian Quilt Research Project. Wish it was a podcast, but it is an interesting read - go here to read the interview. She shared with me via Twitter Saturday evening that this quilt took a year to finish and although it was a challenge for her group which caused a bit of distention, she is very happy with how it turned out. Tami, thank you so much for sharing - it is gorgeous! Taste Matters with Mitchell Davis - Episode 30 with Marion Nestle. They talk about the "calorie" - worth your 30 minutes for the science behind the calorie and how we can us it to make smart food choices. The Moth Podcast - Roald Hoffman/Cocoon of Love 4/9/12. Mr. Hoffman has a wonderful voice but the story is what gripped me and made me go back and listen again. The History Chicks are back with Season 3 and they are giving us some great topics. Katherine of Aragon, Anne Boleyn and a little mini-cast of the Titanic are all new. No photo for the Posole: Pork and Hominy Soup but here are the links: Go here for the Carnitas that I described that go into the soup and go here for the Posole. Both recipes come from www.thenoshery.com. Blueberry-Brown Sugar Plain Cake from Baking: From My Home To Yours by Dorie Greenspan. Go here for the recipe. 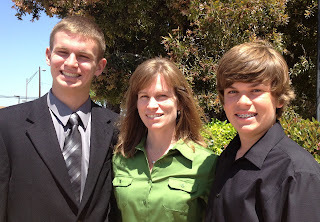 One last thing not related to the podcast - my oldest had his Confirmation ceremony yesterday in our church. oh wow - looks like a very full podcast - I'll listen soon! And congrats on son's confirmation...very cool. Susan, I want to eat at your house! How spicey is the soup? Do you add the jalapenos to yours? My DH is sort of picky, and I wonder if he would eat it. It sounds great to me,though! I'm going to come back and listen to your pod cast on Hawaiian quilting. I love Hawaiian quits. Have yet to make anything more than a pillow; but, I do love them so. I'm so glad you came to the meeting this month. I completely agree with Laura! I really want to eat at your house. I love Carnitas and Posole, so I'll definitely be checking out those recipes. And I have a very similar picture of Hearst Castle that I took when we went to California when I was in high school. Beautiful facade against that amazing blue sky! And congratulations to your son on his Confirmation! I had to laugh when you mentioned Robin teaching at your guild. I follow her blog as her sister Melinda is a member of my guild, and a prominent LAQ in the Atlanta area. 4 degrees of separation! I enjoyed this episode. 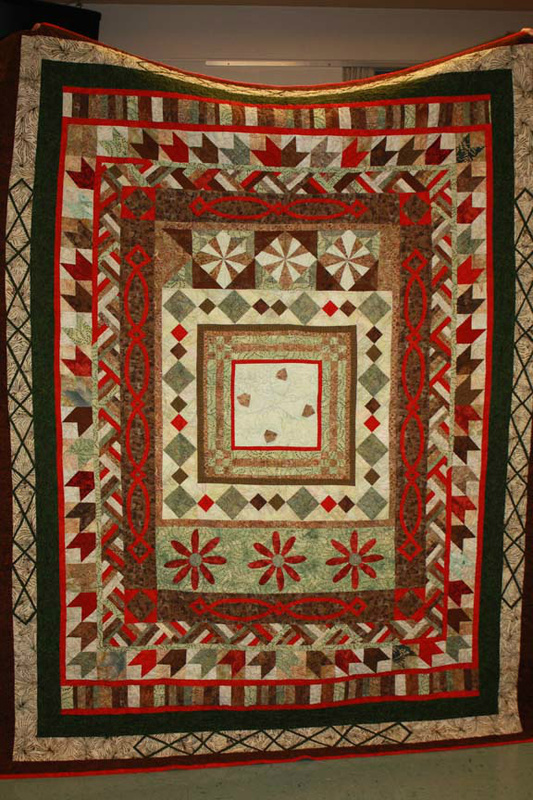 I have been fascinated by Hawaiian quilts since reading The Aloha Quilt (Elm Creek Quilts, #16) by Jennifer Chiaverini. Hearst Castle is on my list of places to visit in CA. Sounds like I will enjoy it. Thanks for the podcast Susan. Your timing is fantastic - I am considering making a Hawaiian quilt for a friend who went to Hawaii on vacation in February and fell in love with it. Her birthday is in November so I have a bit but trying to figure out what I am going to make and how. I very much enjoyed hearing about Hawaiian quilts. Nice pic! The last time we were at Hearst Castle was 1998, when Titanic was winning all the academy awards, we stayed in Carmel and watched it there, my youngest daughter had a huge crush on Leonardo de Caprio... lol. While at Hearst Castle, a helicopter landed and out walked Arnold Schwarzenegger, Maria Shriver and all his kids. They took a private tour just ahead of our group, so we kept running into them. Arnold has thighs like a tree trunk... just sayin'! I'm going to try the Blueberry-Brown Sugar Plain Cake, as I love plain, not too sweet, type cakes. Congrats on your son's Confirmation. Thanks for mentioning me; come to Annapolis any time! Lots of feelings when listening to your podcast and looking at the blog. My dad was our daughter's Confirmation sponsor on Saturday April 14, 2007; they were very close and we had a nice time at a party that night. The next day, Dad fell asleep watching TV and didn't wake up; he was only 70 and we had his funeral Mass five years ago today. I miss him; he was the one who started me on my love of history and I am sure he went to every historic site in California. Later that year, my husband and I got the chance to go to Hawaii. 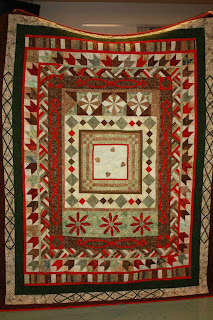 I was not much into quilting, but I loved the colors that I saw. Our family is a sponsor family for young men and women at the Naval Academy; I choked up at Pearl Harbor thinking of how far the sailors had come from Annapolis. Hooray for the History Chicks and The Moth podcasts. My favorite Moth was the one on Father Mychal Judge, who was the first casualty at Ground Zero. Listened to your podcast yesterday. There is a tradition in Germany and, perhaps, Austria and Switzerland as well called Scherenschnitte (share-en-Sh-Knit-UH), which translates to paper cut. I have linked to one example, but have no personal knowledge of this book: http://www.amazon.com/Scherenschnitte-Designs-Techniques-Traditional-Papercutting/dp/1887374183/ref=sr_1_1?ie=UTF8&qid=1335206669&sr=8-1 . Scherenschnitte is the big sister of snowflake cutting that you talked about and allows the artist to create more sophisticated designs. There is some kind of similar tradition in Spanish or Latin culture as well, but I don't know anything about that. It is my understanding that the Hawaiian designs all have a spiritual meaning. The making of the quilts includes something about infusing the quilt with energy. I may not have understood that when I learned or I may have forgotten.